Pen and ink and wash drawing of the relics from Stupa no.2 at Sonari by Frederick Charles Maisey dated 1847-1854. At Sonari, near Sanchi, there is a group of stupas situated on a hilltop. Stupas are Buddhist mounds often enshrining relics. In 'The Bhilsa Topes' of 1966, Alexander Cunningham described the relics found in stupa No.2, "The second of the Sonari Topes is situated north by north west from the Great Tope at a distance of three hundred and fifteen feet...A shaft was sunk down the centre of the Tope, which at 7 feet reached the slab forming the lidof the relic chamber...In the chamber was found a large steatite vase profusely but coarsely ornamented with elephants and horses, and indescribable winged animals of rude execution. 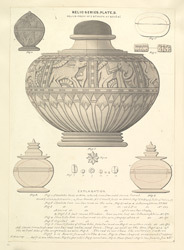 The vase was covered by a plain lid, secured by a lac. Inside the vase were found five relic caskets, each containing portions of human bone, with an inscription recording the name of the person whose relics were enshrined therein...The erection of this Tope, which contained the relics of no less than four of the Buddhist teachers whose ashes had already been discovered in No.2 at Sanchi, must evidently be referred to the same period, towards the end of the thirs century before our era...".